Katie Keenan stands behind the bar at Hemingway’s Cafe on Thursday night, in front of a bar packed with mostly students overflowing the bar stools and infringing on each other’s elbow room. Keenan, wearing a black tank top with the Miller Lite logo across the front, scoops up two bottles of liquor in one hand and a soda gun in the other, pouring a pitcher of Long Island Iced Tea as she nods at yet another customer. Keenan, the 33-year-old general manager of Hem’s, always wanted to be a bartender — in part as a retaliation against her parents’ desire that she go to college. As a path to that goal, Keenan started working as a server at Hem’s in 2003, her sophomore year at Pitt. Keenan started out at Pitt as an English literature major but switched to communication before dropping out during her junior year. 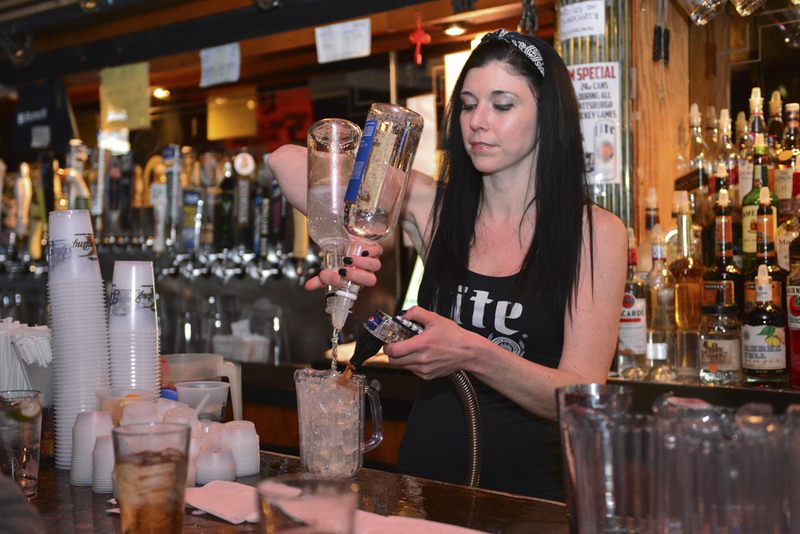 Keenan ditched her server job after her 21st birthday and became a bartender. She moved up to general manager four years ago. Keenan said it’s almost impossible to skip over the process of being a server before taking charge behind the bar. The speed and skill required of the bartender depends heavily on the bar itself — from fast-paced Oakland parties to relatively tranquil Lawrenceville haunts. Despite a belief among some that bartending is little more than a part-time job, a commitment to bar culture can lead to a long-term and financially stable career. According to a CNN Money article, the median wage including tips for a bartender in the U.S. is $15 per hour — or $2,400 per month — although that number goes up to $18.60 per hour and nearly $3,000 per month for a bar manager. Those numbers, however, depend greatly on the specific bar and even the specific bartender. Take, for example, the Huffington Post article about a New York City bartender who made $96,000 in one year. Regardless of the bar itself, bartending takes both training — Pittsburgh’s Elite Bartending School, for example, offers a 40-hour training program — and patience to move up the ranks and earn a spot as a permanent fixture behind the bar top. Jason Endress, bar director of Tender Bar + Kitchen in Lawrenceville, has worked in restaurants since he was a teenager. Although Endress, 33, always looked up to and respected bartenders, he aspired to be a writer. While simultaneously freelance writing, Endress made took his first bartending gig at Sonny’s Tavern in Bloomfield nine years ago. Over time, chances of making it as a writer grew slim, so Endress made the switch to full-time bartending and took a job at Tender three years ago. Though bartending wasn’t his lifelong dream, Endress said the job requires a specific set of personality traits. “Some of the big personal characteristics I would look for in any bartender worth their salt is humility, empathy, honesty and a strong desire to learn,” Endress said. Quality bartenders learn their craft by logging extensive hours behind the bar, according to Endress, but it isn’t the only way to make bartending into a successful career. Endress, for example, spent a year working as a brand ambassador for the bourbon distillery Angel’s Envy, which is based in Louisville, Kentucky. In addition to a diversity of career paths, the food and drink business introduces bartenders to a wide variety of people — especially in Southside’s famous bar scene. Olga Brindar, Bar Manager of Club Café on 12th and East Carson streets, said her bar sees a new set of customers, showgoers and partiers every night. After graduating from Carnegie Mellon University with a B.F.A., Brindar found employment but was laid off during the recession. Brindar cycled through a number of odd jobs — including cleaning houses and tutoring students for the SATs — and then came to Club Café three years ago. Regardless of what type of neighborhood or bar they work in, Pittsburgh’s bartenders benefit from financial stability and a typically night-hours-only schedule. Brindar thinks of bartending as a “recession proof” line of work — poor economic times or not, people will still want to drink. Bartending can work as a second job or, as it is for Brindar, a steady profession. As primarily a music venue, the atmosphere of Club Café is in constant flux, depending on what type of artist is playing on a given night. “If I have a bluegrass band in, I’m going to have completely different set of people coming in than if I have a metal show the following night,” Brindar said. When a music venue meets a bar, the bartender gives up their place as the center of attention and lets the band command the attention of the room. To maintain those positive vibes, Brindar and the other Club Café bartenders adjust their approach depending on the atmosphere of each performance. They can hold lively conversation before rock or hip-hop outfits or remain respectfully quiet during acoustic shows, all while turning around beer, wine and cocktail orders. Club Café serves primarily specialty cocktails — drinks mixed with egg white or topped with gingersnap cookies and pine sprigs. Though Hems’ style is less focused on cocktails and more demanding of pitchers — both beer and shot — the intensity of Oakland’s bar scene falls in the same category as Southside’s. Most patrons at Hem’s are looking to get drunk fast, which means the bar gets crowded and demanding, especially on weekend nights. With this environment in mind, Keenan said only certain personality types are suited to take up a post behind the bar.